Boise State Conference 2018: Memory & Emotion. Between March 15-18 some of us from the CBS attended the Conference organized at Boise State University by the Department of World Languages: the 1st International Cultural Studies Conference, organized by the professors Nere Lete and Larraitz Ariznabarreta. The Conference’s main theme was Memory and Emotion. Women Stories: Constructing Meaning from Memory. The Conference was divided into different panels and exhibitions. On Thursday, the main panels were “Autobiography as Abode,” “Bodies and Spaces of Violence” and the Exhibit “Gernika: Voices after the Bombs” that was exhibited in the Boise Basque Museum by Xabier Irujo, on loan from our very own Jon Bilbao Basque Library. Friday’s main panels were “(Basque) Diaspora and Beyond” and “Trauma and Liminal Spaces-Between Memory and Oblivion.” The weekend panel was “The Circle of Memory, Emotion, and Gender,” a panel that embraced two art exhibits such as “Step Into my Past: Life in a Basque Neighborhood” by the painter Frank Goitia, as well as Alejandra Regalado’s, “In Reference To” that was followed by a Community Panel Discussion. Later that evening, the participants celebrated the event with the Boise Basque community with dinner at the Basque Center. The last day March 18, the main panel was “History as Motif-Retelling Narratives.”. 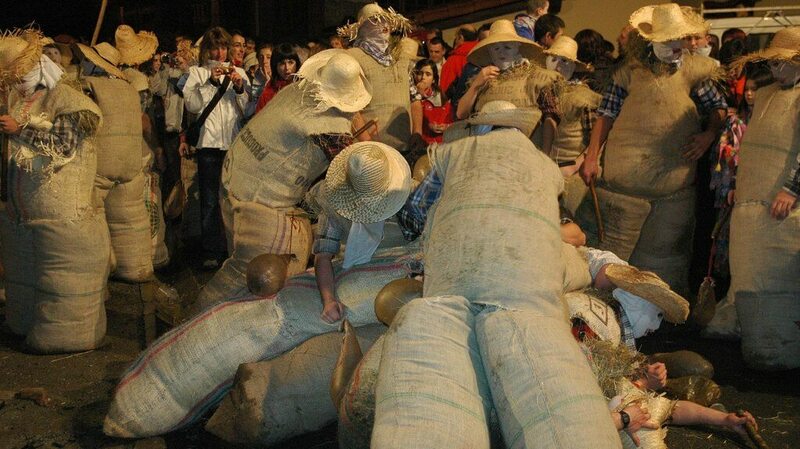 We have to say goodbye to the shortest month of the year, but one of the busiest in the Basque Country. 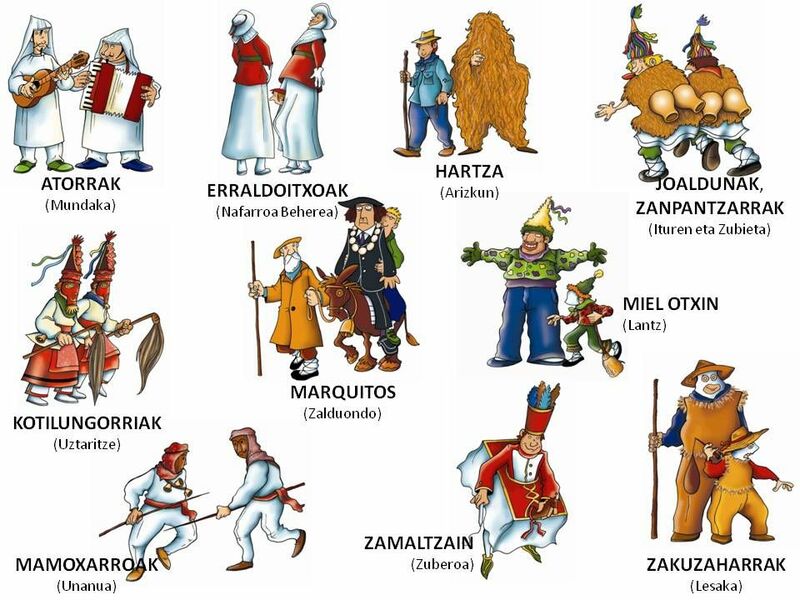 During the month of February they celebrate the inauteriak ihauteak, ihoteak or aratusteak (carnivals or Mardi Gras) all over the Basque Country. 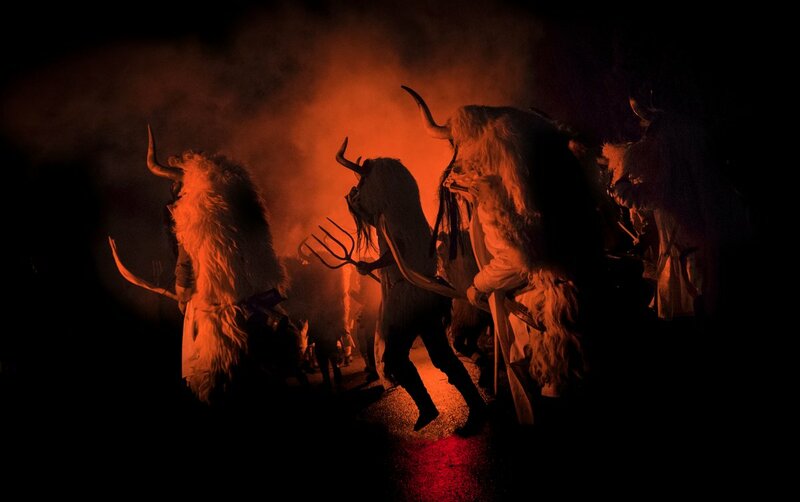 They are the popular festivals of pagan character that are celebrated in many cases the three days preceding Ash Wednesday and are celebrated differently depending on the area. 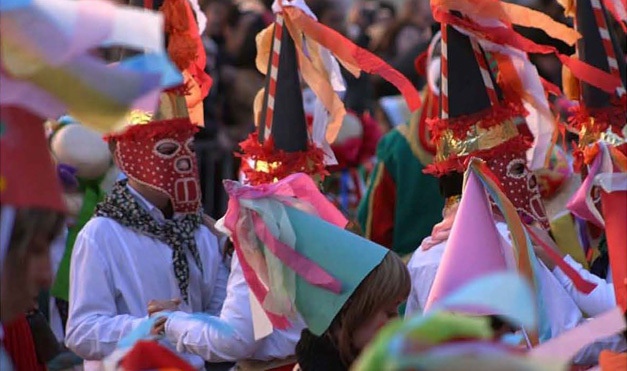 During the Franco period, many of the celebrations that were part of these carnivals were banned and persecuted. Thankfully in most areas the traditions were recovered. 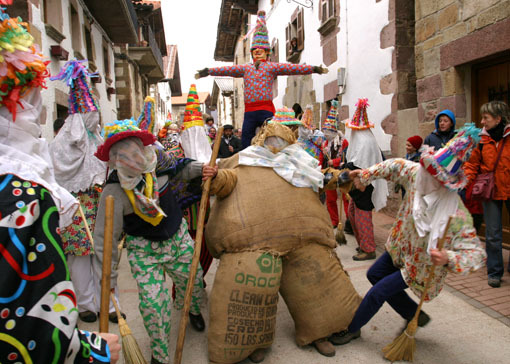 The following photos show how unique the different costumes and events are throughout the Basque Country. Check out what our grad students are up to during Spring 2018! Seems like a busy semester! My last semester at the CBS is coming to an end and it is a bittersweet sensation. I am so excited to be presenting my PhD thesis, the project I have been working so hard on. But at the same time I am sad to say goodbye to what it was my life and my home for the last four years. Nevertheless, before that happens I still have some exciting months full of interesting events showing up on the horizon. Although the semester will be centered mainly on the writing process, I will have a couple of conferences between March and April. I will be presenting a paper in Boise this coming March in the “Memory and Emotion, Women’s Stories: Constructing Meaning from Memory”, a conference organized by the world literature department at Boise State University. I will also be presenting a poster in the “Northern Nevada Diversity: Challenges, Changes, and Solutions: The Reality of Equity and Diversity within Higher Education and the Community”. Besides my academic projects, I will hopefully be able to enjoy a few days of hiking and movie dates to keep me motivated and ready to defend my thesis. Wish me luck! This semester will be a wild one indeed. I am happy to have the opportunity to teach “War, Occupation, and Memory in the Basque Borderlands” this term, and even more happy about the number of students enrolled and their interest in the material! Getting to teach reminds me of the reason I’m here: I want to be a professor and love teaching! However, I have other responsibilities to attend to. I’m taking two courses this semester, “History of Women in the United States” and an independent study with Dr. Dworkin at the History department on “Cultural Theory and History.” Luckily, these two courses will keep me on track for my comprehensive exams, which I will be taking at the end of April. I have a few conferences ahead this semester as well. First off, I’ll be going to Boise for BSU’s Department of World Languages’ “Memory and Emotion. Women’s Stories: Constructing Meaning from Memory” conference this March. I’ll be presenting a paper entitled “Basque Women in the West: Bringing Migrants out of the Shadows,” which will review the historiography on the subject and avenues for further research. In April, I will travel to Santa Barbara for UCSB’s “Verbal Kaleidoscope: First Annual Writers and Scholars in Indigenous Languages and Literatures Conference.” There, I will present a completely different paper entitled “Basque Nationalism with a Punk Voice: The Use of Euskara in Basque Radikal Rock,” a side-project of mine dealing with the renegotiation of Basqueness through musical movements. Later in the summer, I will be traveling to the Basque Country for my field work, and have two conferences lined up: one in Salamanca and the other in Gran Canaria. My paper “Memoirs of Mobility and Place: Portrayals of Basque-American Identity in Literature of Nevada” has been published in the upcoming book Artes y Diaspora, by Eusko Ikaskuntza. I will also be writing another article on “Gendering the American West” for an edition being published on “América y la emigración Vasca. Procesos de investigación.” Overall, this will be an exciting semester, full of hard work, writing, and research. This semester I have returned to the Center for Basque Studies and started writing my dissertation after having completed a year of fieldwork in the Basque Country. I am also working as editor to turn the panel I organized for the 116th American Anthropological Association into a special edition for a journal with my fellow panelists. I will attend a conference in March titled “Memory and Emotion, Women’s Stories: Constructing Meaning from Memory”, and am preparing a panel for the Association for the Study of Food and Society conference this summer. Last year was one of the most exciting years on the books, but I look forward to finding more insight into my research as I continue with the writing process and complete my dissertation at the end of this year. This semester, in addition to a Basque Culture class, with Dr. Irujo’s guidance, I have expanded my coursework to include a Political Science class. Politics is a main area in the development of my thesis and additional courses in this department will be taken over the next several semesters. In addition to class, I plan to travel to Boise for archival research at the Basque Museum and Idaho Historical Museum. Eskerrik asko! During the spring 2018 semester, I am teaching PSC 211 “Introduction to Comparative Politics.” In addition, I look forward to defending my dissertation on April 2018. This semester, I am also applying to PhD program in several universities including UNR. My research interests lie in the areas of community economic development, cooperative movement, sustainable development, comparative politics, and international relations. I have dedicated much of my time and energy to refine my understanding of the cooperative concept and its socio-economic potential through my ongoing research agenda at the University of Nevada. We are doing exciting things indeed! If you’d like to be part of our lively international cohort, apply for the Basque Tutorial Ph.D. today! Last Saturday, the 23rd of September, we celebrated the annual Basque Ladies Luncheon at the restaurant, Louis Basque Corner. It is an essential event for all the Basque ladies in Reno and its surrounding areas. A unique occasion to gather together, and when there’s food on the table of a good restaurant, it is even better! The event began at 11.30am, and the restaurant was pretty full when we arrived. The ladies, with their Lauburu necklaces -in all sizes and colors- were conversing, laughing, and loving each other’s company, some of them, the bravest ones, were drinking Picon Punch. The talented ladies Judy Mendeguia and Joanie Test shared their beautiful handmade horseshoes and crosses with us, such beautiful and exceptional artwork made with so much love and passion. The Center for Basque Studies didn’t want to miss out on the opportunity to show and share our latest publications with the ladies. The reception of our books was incredible, thank you so much! Around noon we began having lunch, and the menu was delicious. The traditional Basque family-style lunch included soup of the day, French bread, Basque beans, salad, French fries, an entree, and a complimentary glass of house wine or a soft drink, and coffee. They set up an area for us and they treated us phenomenally. Unfortunately, this lunch wasn’t the same without our beloved, Florence Larraneta Frye who was unable to attend. She is an amazing Basque woman who made the endeavor of the Basque Ladies Luncheon a reality, a dream come true. It is also worth thanking Kate Camino for maintaining the spirit and us ladies together. Last Monday, September 11, we welcomed the author of the “Ulysses Syndrome,” Prof. Dr. Joseba Achotegui from the University of Barcelona to the Center for Basque Studies. He is the General Secretary of the Transcultural Section at the World Psychiatric Association, a psychiatrist, and tenured professor. He has also been the Director of SAPPIR (Psychopathological and Psychosocial Support Service for Immigrants and Refugees) at the Hospital of Sant Pere Claver in Barcelona, and Director of the online postgraduate course”Mental health, cultural processes and psychological interventions with immigrants, minorities, and the socially excluded” at the University of Barcelona since 1997. The purpose of his visit was to explain the “Ulysses Syndrome,” its consequences and possible solutions. The Ulysses Syndrome has become more common in the 21st century with the increase in the migration of individuals. He explained how migrating today is becoming a process that is so intense and stressful for millions of people that they are unable to overcome these difficulties. Because of this inability to adapt to their new countries, these individuals are the candidates for the Ulysses Syndrome (with reference to the Greek hero who suffered countless adversities and dangers far from his loved ones). He argued that even though Ulysses was a demigod, he barely survived the terrible adversities and dangers of his journey. Extrapolating The Odyssey to those individuals who enter new surroundings and suffer the difficulties of integration, Achotegui has set out a diagnosis for mental health problems that are not pathological. The set of symptoms that make up this syndrome are now an emerging mental health problem in the host countries of immigrants. He described the most important stressors as: the forced separation of loved ones, a rupture in the attachment instinct, the feeling of hopelessness due to the failure of the migration project and the lack of opportunities, and the struggle for survival. He mentioned different steps and ways to help these migrants who go through Ulysses Syndrome, such as breathing and relaxation techniques, physical exercise, eating habits and positive thinking. All these thing can help in their adaptation process. Prof. Dr. Achotegui at the Center for Basque Studies by Inaki Arrieta Baro, Jon Bilbao Basque Library. It was a very interesting presentation for many of us who immigrated to the United States. Thankfully, the CBS and its team make the transition as comfortable as possible, however, there will always be challenges when facing new situations. It definitely gave a perspective of how previous and current immigrants struggle for survival and integration in their new host countries. The group Delorean, from Zarautz (Gipuzkoa), recently reinterpreted the music of Mikel Laboa with an electronic touch at a one-off concert in Bilbao’s Arriaga Theater. Check out this teaser. According to the band’s Facebook page, while this was just a one-off gig, it is considering doing a whole album covering Laboa songs at some time in the future. 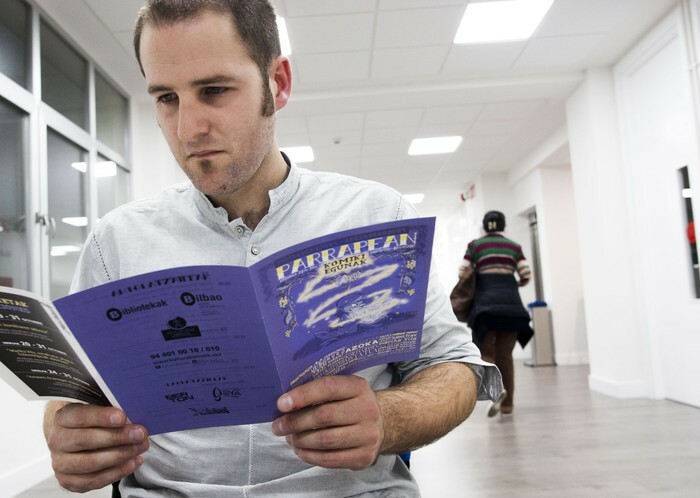 If you’re interested in popular music, check out Jon Eskisabel Urtuzaga’s Basque Songwriting: Pop, Rock, Folk, available free to download here, courtesy of the Etxepare Basque Institute. The Basque illustrator Adur Larrea, has created a graphic novel about the life of Gabriel Aresti (1933-1975), one of the most influential Basque writers and poets: Gabriel Aresti, BioGrafikoa (Gabriel Aresti: A BioGraphic), published by the Erroa press. The comic has 90 pages spanning a period between the 1930s and the 1970s that chart the life of the great writer. 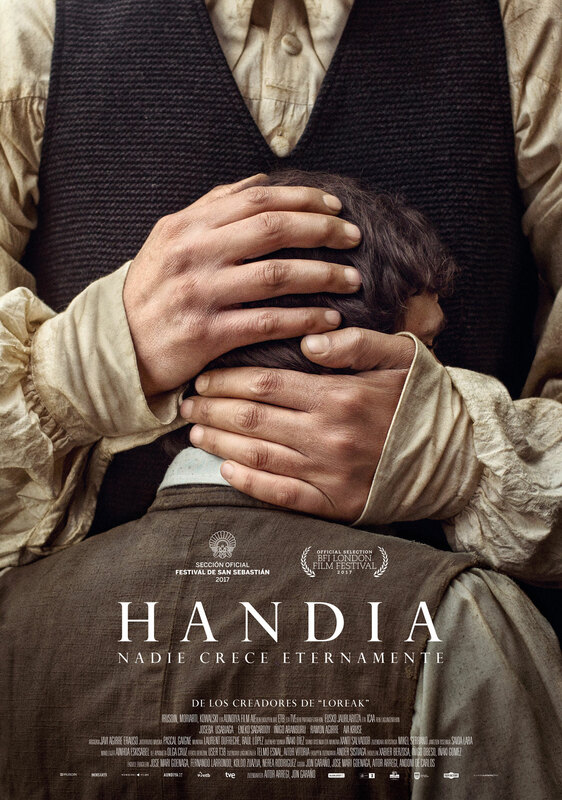 Adur combines both Spanish and Basque to offer a natural portrait of Bilbao, Aresti’s home town. The book goes on sale today, November 19, and if you want to taste a little bit of this work click here. The Center for Basque Studies has an interesting selection of books in its Basque Literature and Graphic Novels sections.